It is our great pleasure to invite you to join the InterCor team and to contribute with your clinical experience, wealth of knowledge in cardiology and team spirit by engaging in teaching the young generation Ghanaian physicians to improve cardiovascular healthcare for the underserved communities. This initiative is addressed to active and retired cardiologist volunteers and Chiefs of cardiology centres to support this mentorship program. Currently, sub-Saharan Africa (SSA) does not have adequate qualified cardiology capacity to cope with the high demand of cardiovascular services. Every third/fourth adult African is confounded with cardiovascular disease risk factors such as diabetes II and hypertension. Physicians in sub-Saharan Africa (SSA) are challenged with early and proper diagnosis and the treatment of congenital heart (CHD) and rheumatic diseases (RHD), tuberculous constrictive pericarditis (CP), endodmyocardial fibrosis (EMF), hypertensive and arryhthmogenic cardiomyopathies at various clinical stages followed by degenerative valve (DVD) and coronary artery diseases (CAD). The major reasons for this initiative is the alarming situation in cardiology capacity and services in Africa. Ghana has only one board certified paediatric cardiologist and 13 adult cardiologists for the 29.8 million population (11 million under 15 years of age). The situation therefore, demands immediate training programs in echocardiography to improve the capacity and accessibility for echocardiographic diagnostic services for the underserved communities and to support perioperative cardiac care. To teach clinicians and residents echocardiographic diagnostics. To strengthen cardiology capacity and improve cardiology clinics and services. To bring the underserved population to a stage of diagnosis for proper conservative (Phase II) and surgical (Phase III 2020) therapies of their cardiac diseases. Retooling of intensive care unit to manage critically ill patients, develop cardiology emergency training and management and develop an infrastructure for interventional cardiology and postcardiotomy care. Thus saving lives of underserved population with CHDs and RHDs. 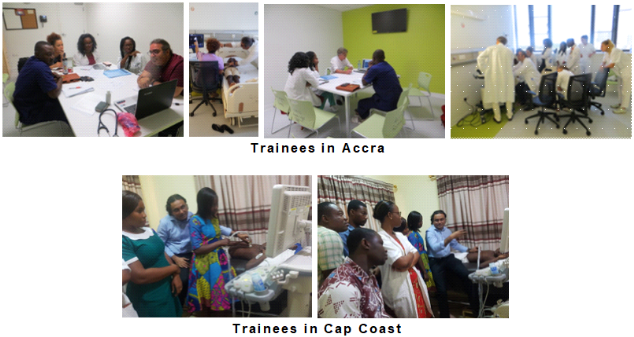 While addressing strategies for training programs in cardiology and cardiac surgery for young generation Africans, InterCor has already begun echocardiography courses in Ghana since September and December 2018 to tackle the increasing demand for cardiologists. Dr. Andreas Kaestner, Private Paediatric Clinic, Berlin, Dr. Mustafa Yigitbasi, Prof. Dr. Charles Yankah, Deutsches Herzzentrum Berlin and Dr. Himal Dama, Heart Centre, Durban. Dr. Henning Kuehne, Interventional Cardiologist, Berlin. InterCor will develop high quality teaching and training programs with standards to offer overseas trainees wishing to join the team for short or long periods. PASCaTS is applying to European chambers of physicians for supporting trainees taking time out of program to widen their clinical skills and knowledge in tropical cardiovscaular medicine. Project Management: PASCaTS in collaboration with DHZB. InterCor is a taskforce of PASCaTS which is recruiting volunteer cardiovascular specialists for missions in Ghana, West Africa. It operates in collaboration with PASCAR, German Heart Centre Berlin, Paediatric Clinic Berlin, University of Erlangen, to train physicians in echocardiography/cardiology in Ghana (Phase II). Its aims are to strengthen universal health coverage for the underserved population at secondary and tertiary level. The project will support perioperative cardiac care to strengthen the cardiology services and improve the outcomes of long-term follow-up patients. InterCor has just completed a heart screening program for rheumatic heart disease (RHD) among 4750 children and adolescents in Ghana (Phase I).